San Diego, Calif., Jan. 27, 2016 — When one imagines a high school biology lesson, certain learning processes come to mind: lectures, slideshows, whiteboards and markers, small lab experiments. Probably not among them: watching organelles and molecules float past in a human cell, reaching out to them with your bare hands and seeing what they produce when brought together. 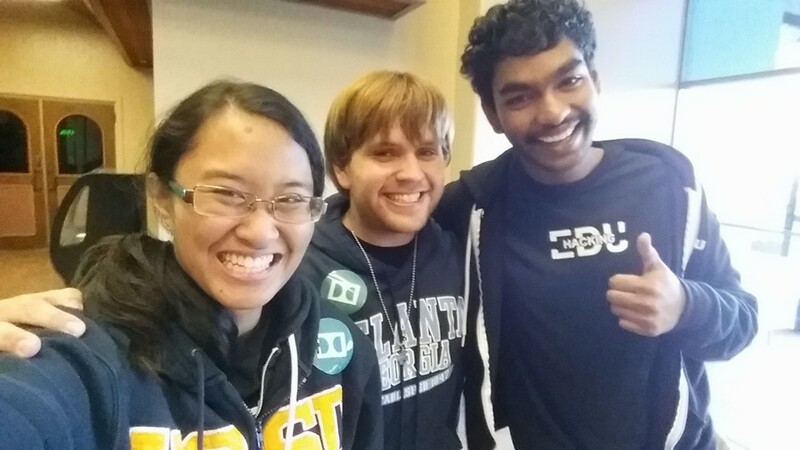 Kristin Agcaoili, Connor Smith and Anish Kannan at the HackingEDU Hackathon. This is the “hands-on” approach to biology seen in Cell VR, a virtual reality experience developed by University of California, San Diego undergraduates Kristin Agcaoili, Anish Kannan and Connor Smith. Created at HackingEDU, a 36-hour education-themed hacking competition (or “hackathon”) in San Mateo, Calif., Cell VR offers a radically new approach to high school-level biology: immersing its user inside a human cell. For Agcaoili, Kannan and Smith, who are sophomores majoring in Computer Science and Engineering (CSE), these sorts of inventive, socially conscious virtual reality hacks are regular occurrences. In the past year, they have traveled to hackathons in cities up and down the Western states, from Berkeley to Tucson, and even as far afield as Atlanta, Ga., where they represented UC San Diego in Georgia Tech’s HackGT hackathon. Their projects’ subject matter is equally far-ranging: in addition to Cell VR, they have built an environmental awareness experience, a narrative-driven game, a virtual workspace and a “health hack,” which uses soothing landscapes to reduce stress and lower heart rates. Diver, the team's environmental awareness project, was named the best game and VR hack at HackSC 2015, a hackathon hosted by the University of Southern California. Their reception has been enthusiastic. At HackingEDU, where more than 1,000 students comprising 100 teams competed to develop digital education tools, Cell VR took third place. 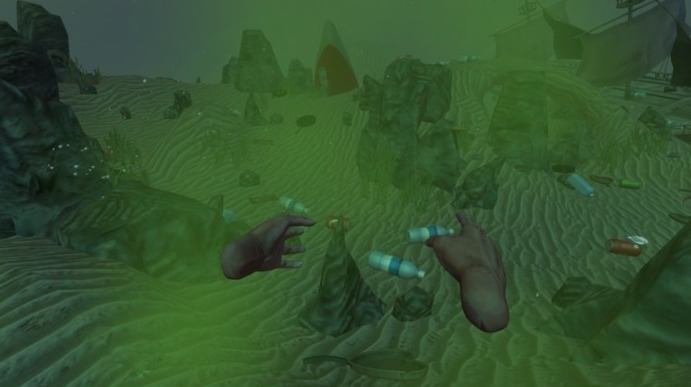 A few weeks later, Diver, their environmental awareness project, was named the best game and VR hack at HackSC 2015, a hackathon hosted by the University of Southern California. Designed to bring attention to marine pollution, it tasks its user with swimming around an ocean and picking up trash: bottles, cans, even frying pans. The team’s accomplishments at HackingEDU and HackSC marked both the beginning of further success and a return to their roots. It was at HackSC 2014 that Smith first began working with virtual reality, a step that later led to his collaborations with Agcaoili and Kannan. After creating a virtual reality game for the Oculus Rift headse t—“my first virtual reality experience,” according to Smith — he made the acquaintance of a USC student named Jake Green, who hoped to develop education-related virtual reality experiences. (Green is now the C.E.O. of the Los Angeles-based virtual reality company Zypre.) Eager to forge connections with potential collaborators at UC San Diego, he enlisted Smith’s help. Smith, in turn, brought on board five of his friends, including Agcaoili and Kannan. “After that, we very much kept interest in the idea of doing something educational,” said Smith. In their new projects, Agcaoili, Kannan and Smith aim both to engage this interest and to foster it in others. Virtual reality experiences like Cell VR, they note, have tremendous potential to impact high school students in particular, who are at what Smith called a “deterministic age” for their educational future. 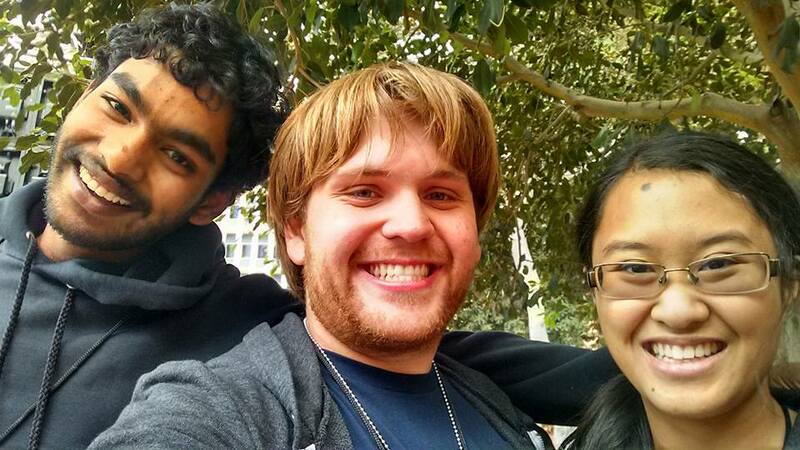 Kannan, Smith and Agcaoili at HackSC 2015. HackingEDU’s support and sponsorship, they said, have been instrumental in helping them achieve this. In addition to helping Agcaoili, Kannan and Smith obtain publicity for Cell VR, the organization is working to implement the program in high school classrooms; they’ve also sent the team a range of high-powered, not-yet-commercially-available virtual reality equipment, including an Oculus Rift headset (tentatively slated for a public release date of March 2016). Closer to home, further development of Cell VR and other virtual reality experiences is ongoing, with contributions from one of Agcaoili, Kannan and Smith’s other undertakings: UC San Diego’s recently established Virtual Reality Club, in which all three are officers. One of the university’s fastest-growing groups, Virtual Reality Club operates as an informal teaching program, hosting weekly workshops for virtual reality novices and experienced developers alike, and as a professional organization, connecting students to companies and internship programs. Much of their work is collaborative; Kannan noted that he, Agcaoili and Smith are sharing some of their prior virtual reality projects with the group “so anyone can try to fork off of them, improve them, do what they want with them.” The club also serves as a node in a network of similar groups at other colleges and universities, which they eventually hope to bring together for a UC San Diego-hosted virtual reality hackathon. They also will enable further collaboration within the club’s ranks: “We’re also thinking about importing Cell VR to the Cardboard so that more people could access it,” said Kannan. Even with all that lies ahead for their prize-winning projects and their growing club, Agcaoili, Kannan and Smith remain focused on learning: on helping others learn, and on continuing to learn themselves. “I think if I’m imparting any words of wisdom,” said Smith, “it’s that to go to these hackathons, you don’t need experience; you don’t need to be extremely good at something…. It just matters that you try to learn something, that you try to achieve something, and that you’re passionate about that. You try to do something you care about.” Doing so, he said, will always produce dividends.